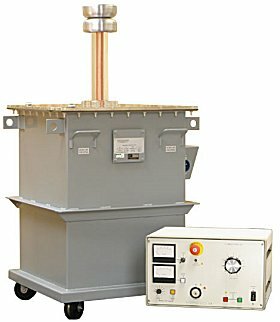 The KV50-200 and KV100-100 are high power, high voltage AC test systems designed for insulation testing. These systems are equally suited to both development and routine testing of electrical insulation systems and plant. Each unit is available in either a low partial discharge version or without a specified discharge level. The equipment consists of a control unit and a separate oil filled high voltage transformer, linked by five (5) meter supply and control cables. The control unit is fitted with a comprehensive range of facilities for control, metering and protection. Variable electronic trip - 10% to 110% of rated output. Both systems include secondary tap metering as standard to ensure accurate voltage metering. The output voltage and current are displayed on large, linear analog instruments, and a variable electronic trip is provided, allowing the trip current to be set to 10% to 110% of rated output. The high voltage transformer is housed in an oil-filled steel tank fitted with swivel castors for mobility. The units use a low-discharge oil-filled bushing for the high voltage output. Both the KV50-200 and the KV100-100 are equally suited to testing capacitive, resistive or inductive test objects. Low discharge versions of the units are available as an option (KV50-200LD and KV100-100LD), with maximum discharge levels of 1pC and 3pC respectively. The partial discharge levels on the standard KV50-200 and KV100-100 are not specified. Control Unit and KV50-200 Transformer, Including 1 x 5-meter Power interconnecting lead, 2 x 5-meter interconnecting leads, Spare fuse set, and Operating manual. Control Unit and KV100-100 Transformer, Including 1 x 5-meter Power interconnecting lead, 2 x 5-meter interconnecting leads, Spare fuse set, and Operating manual. Control Unit and KV50-200LD Transformer, Including 1 x 5-meter Power interconnecting lead, 2 x 5-meter interconnecting leads, Spare fuse set, and Operating manual. Control Unit and KV100-100LD Transformer, Including 1 x 5-meter Power interconnecting lead, 2 x 5-meter interconnecting leads, Spare fuse set, and Operating manual.